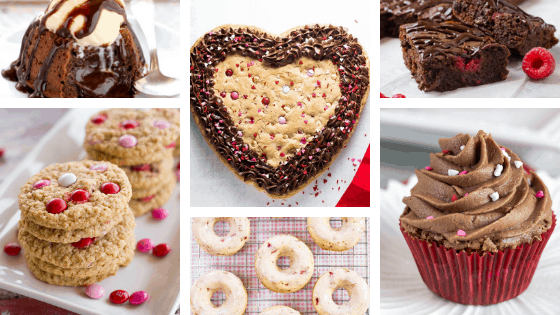 Show your loved ones how much you love and appreciate them this Valentine’s Day by giving them something homemade, sweet, and delicious. This list of Valentine’s Day dessert ideas will inspire you to get creative and will help you surprise your loved ones with something tasty! Say I love you with a cupcake brownie topped with homemade fudgy chocolate frosting. These adorable heart-shaped cherry pies are incredibly easy and fun to make – so easy the kids can help! These baked doughnuts are perfect for breakfast or for dessert! This rustic tart is easy to make and uses very little ingredients. These bite-sized treats are so cute that’d they be perfect to give as gifts! This chocolate lava cake would be a great way to end your stay-in dinner date! These fudge brownie truffles are perfect to gift-giving! These adorable and sweet fudge hearts would work great as a gift, too! Another great gift idea are these sweetheart truffles. This milkshake recipe easily serves 4- it’s perfect for a family Valentine’s Day treat! Calling all lovers of cherries – this heart-shaped brownie is perfect! Serve these raspberry brownies to your family after dinner and your family will love it! These adorable cookies would be perfect as a homemade treat for teachers or for class parties. A delicious gluten-free option- heart-shaped ice cream sandwiches! This cookie cake is perfect for serving a crowd! It looks great, too! These stained glass cookies are perfect to give if you’re looking for something creative and unique!